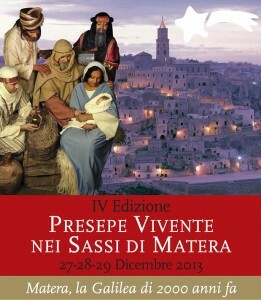 Plenty of advance warning here for this beautiful event, the fourth edition of the Presepe Vivente, or “living Christmas Crib”, which will be held in the atmospheric sassi of Matera. There can be few places on earth which can manage to recreate with such authenticity the backdrop to the Christmas story, apart from Bethlehem itself. This year’s edition is entitled “ Matera, the Galilee of 2000 years ago” and promises to be as unforgettable as those of previous years. As well as the living crib itself, there is also a market where local artisans, artists and food and wine producers offer visitors a taste of the real Matera.